Though there has been a surprising lack of snow in many parts of the country, the winter season is approaching its peak. It may not seem like it right now, but the warm thaws of spring aren't far off in the distance. While you may have had your fill of winter already, your children are likely still excited about the prospect of school cancellations and snow-covered winter wonderlands. Fathers should take advantage of the remaining cold weather to expose their little ones to the season's thrills. 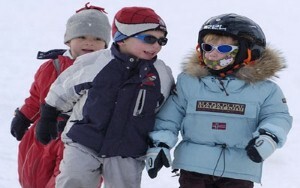 Here are three winter activities for dads to enjoy with their kids. Whether it's ice hockey, figure skating or just for fun, ice skating is one of winter's most magical activities – strapping on a pair of freshly-sharpened blades and taking off across the ice. You can go skating indoors at almost any time of year, but the cold weather allows for the added enjoyment of gliding across a frozen pond. If you're a little rusty or taking the ice for the first time, this can be a great opportunity to practice the basics alongside your little ones as they get a feel for their skates. Having a snowball fight is great and it can be even more exciting when you have an elaborate snow fort to defend. This activity depends largely on the amount of snow available, but kids can spend hours and hours digging tunnels, building walls, fashioning windows and amassing a supply of snowballs. Bringing in other kids from the neighborhood to play along will make this a winter memory your kids will cherish for years to come. If there are vast woods to explore nearby your home, going for a hike following a snowstorm can be a mystifying activity. With everything covered in soft snow, the forest trails can be especially fun to explore as you follow rabbit or deer tracks, uncover frozen streams and take in the mystifying silence all around you.